Dr.Goutam Sutradhar passed Bachelor in Mechanical Engineering from Jalpaiguri Government Engineering College in 1984 and subsequently he did his Masters Degree in Mechanical Engineering (Specialization in Foundry Technology) from IIT Kharagpur 1986 and PhD in Engineering from Birla Institute of Technology (BIT) Mesra, Ranchi. After Five years of Industrial Experience in Hindustan Motors Limited and Indian Railways he joined as Faculty Member in National Institute of Foundry & Forge Technology , Ranchi in 1991. 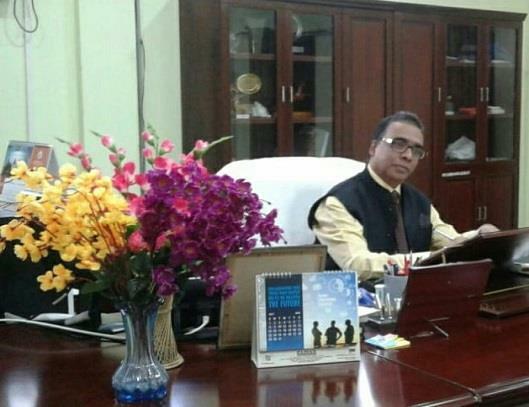 After that he had served Serampore Textile College and Kalyani Government Engineering College about 10 years and finally he had joined as Professor, Department of Mechanical Engineering of Jadavpur University Kolkata in 2005. He taught many subjects like Manufacturing Processes , Mechanical Handling of Materials , Metrology , Machining Technology etc. However , apart from his regular teaching he guided more than 20 M.Thesis and 11 PhD students in the field of Metal Matrix Composites / Polymer Matrix Composites/Development of environment friendly materials/ Synthesis of Forged Powder Metallurgy Components/ Metal Casting Processes etc. He is actively engaged in Foundry Cluster Development Program initiated by TIFAC , New Delhi and MSME, West Bengal and Govt. of India . He has authored Two Books like Design and Manufacturing : An Integrated Approach from Oxford &IBH and Foundry Process Design from New Age Publishers , New Delhi . He had published more than 75 Technical Papers in referred Journals of National and International importance. He has supervised many research projects sponsored by AICTE, New Delhi ; CSIR, New Delhi ; UGC, New Delhi ; DST, New Delhi. He is a Fellow of The Institution of Engineers (India) and member of many professional bodies. Presently, he is the Vice Chairman , Eastern Region of The Indian Institute of Foundrymen. He had visited Japan Foundries as IIF Delegate , Presented his paper in 53rd International Foundry congress at Slovenia, visited University of Wisconsin-Milwaukee , US as International Fellow. He was awarded two Best Paper Awards from The Institute of Engineers (India) and also one from The Institute of Indian Foundrymen. He was awarded SERC Visiting fellowship sponsored by DST , New Delhi in 1996 and EMINTE fellowship by Europe Union in 2014. Recently he had awarded as Dedicated Foundry Professor from IIF Eastern Region. He is one of the major contributor for Nationally Coordinated Project under Make in India Program in Metal Casting Technology i,e SMART FOUNDRY : 2020 [ Sustainable Metal Casting Advance Research & Technology VISION 2020] sponsored by DST, New Delhi, Presently he is Honorary Vice Chairman of Board of Governors of Vivekananda Technical Institute Located at Foundry Park , Ranihati , Howrah which is coming up as an Institute for the development of Manpower in Foundry Technology and its allied fields under the aegis of Foundry Cluster Development Association (FCDA) , Howrah. He had advised many MSME Foundries of Howrah, Rajkot , Bhiwadi , Parwano etc. in individual capacity and on behalf of The Institute of Indian Foundrymen and also Jadavpur University to make Value Aided Products like Steel / DI / Grey Cast Iron , Aluminum Castings (Railway items like Side Frame , Bolt Star , Coupler , Yoke , Knuckle , Axle Housing , Components of American Railways and components of Textile & Jute machinery, BHEL Transformer cover etc.) with the help of Computer Aided Simulation Software and his past experiences. Presently he is the technical advisor on behalf of Jadavpur University for Modernization of Angus Works, Baidyabati of Braithwaite & Company Limited (Ministry of Railways) , Kolkata.